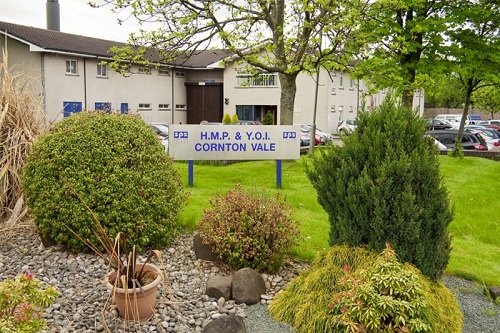 In November, three Mothers’ Union members plus the husband of one visited Cornton Vale prison, a women’s prison on the outskirts of Stirling. We started our visit at the Family Hub where we met the Staff Training and Development Officer who would be our guide during our visit. Over tea and biscuits, we informed him of the donations of knickers and toiletries that Mothers’ Union members provide for the women and girls. We explained that we also give a signed Christmas Card, recognising that is possibly the only card that some women and girls get. We were then introduced to the Social and Community Development Officer, who told us of his work within the communities and towns around the prison, seeking work experience for soon-to-be-released women, to acclimatise them to the routines of regular work and to help them develop appropriate work-related habits. He shared with us that around 36 local employers have been willing to give the women a work placement; a chance for these women to develop life skills and work-related abilities. He gave us examples of the types of work these women did, telling us, with considerable enthusiasm, that one woman had performed so well on her placement that she had been offered a permanent job as a shop assistant on release from prison. We were then introduced to the Deputy Governor, and informed that, in practice, he is often the day-to-day governor of the prison. He told us of historical conditions in Cornton Vale and of the efforts made to improve conditions for the women and girls. He explained how these changes, in turn, improved conditions for staff. The Deputy Governor told us of his work in previous prisons, comparing those prison conditions with Cornton Vale. The Staff Training and Development Officer, having worked in similar and different institutions to the Deputy Governor, contributed to this discussion, helping us to understand how the current caring and nurturing ethos of Cornton Vale had come about. The Deputy Governor then told us of plans to further develop Cornton Vale, including plans for a new prison building, due by 2020. The Staff Training and Development Officer then led us on a tour of the prison. We were taken into now-disused, old-style prison accommodation where the challenges the women and girls faced in the past with bathing/showering and toileting, were outlined. We were told that in such accommodation, where the cells were arranged in blocks of eight per set of toilet facilities, through the night when the women and girls were locked in their rooms, each was allowed only 7 minutes to use the facilities and then locked back in their rooms before anyone else could go. In consequence, some women and girls were forced to wait almost an hour to use the toilet, as only one person could be freed from their cell at any one time. We entered the housing block where women and girls are taken immediately after sentencing by the court. During these first 48 hours, the women and girls normally have only the clothes they were wearing when sentenced. Now, thanks to the knickers and toiletries provided by Mothers’ Union members, during this period the women and girls can freshen-up and put on new underwear. The Staff Training and Development Officer explained to us that a male prisoner starting a prison sentence will usually have his needs for (say) clean clothes, appropriate footwear and toiletries met by the women in his life – typically his wife, mother and/or sister. In contrast, a female prisoner, even if she has a male partner, is unlikely to have her comparable needs met. Furthermore, as many of the women prisoners are mothers of young children, close female relatives of such women are likely to be focussed on child care and ongoing child support. So, for these newly-sentenced women and girls, discovering that a Mothers’ Union member cares about them is very empowering. Finally, the Staff Training and Development Officer led us to the far end of the site. We stood on the steps of a now-disused building and were shown where other, now demolished, buildings had stood. We saw the land, adjacent to the river, on which the new prison building will be built. With considerable enthusiasm, the Staff Training and Development Officer painted for us word-pictures of how the various parts of this new prison will be arranged. He went on to explain that each cell window will overlook the river, giving the women and girls a peaceful, tranquil outlook, and that no bars will be needed at the windows; advances in technology have made it possible to install escape-proof cell windows. On our way back to the Family Hub, and outwith the locked prison complex, we saw the home-like, accommodation units in which small groups of women live in the six months or so, prior to release, and where the women are taught how to cook, clean and care for a home. It was explained to us that those who had lived in care as girls, and had come directly into the prison system, had never had a chance to live independently. Consequently, these women need to be taught life skills, including the skills mentioned above, how to budget and how to use buses to get around. Back at the Family Hub we had the chance to ask last-minute questions. Almost 3.5 hours after we arrived for our visit, it was time to depart. The prison staff had truly been generous in giving us their time and in sharing with us their knowledge, expertise and enthusiasm for working with the women and girls at Cornton Vale prison. As the weather gets colder and we stay inside more often YF still keeps on. After sleeping in the shadow of the Castle, bowling our way through the isles, reflecting on those who gave us everything for us all. We pampered and relaxed ourselves right before we Wrecked the place on film night. 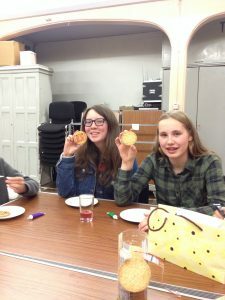 Look out for the YF starring on the Provincial Youth Page this advent, until then here is us making a decorating biscuits cause… well because! Youth work took me from a traditional Young Church setting, where I was brought by my parents each week, to one where I was engaged with church life and my faith. More importantly, going to church became my own decision. I remember getting in the Youth Fellowship (YF) mini bus on a Sunday night and heading off for what was really a random adventure somewhere around Fife. Beach trips, walks into the woods, swimming, chips, water fights, hikes, chips, hitting sticks, BBQs, cinema trips and chips to name just a few. 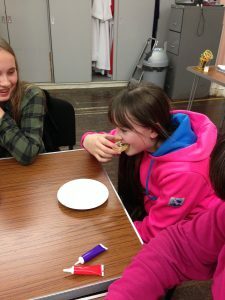 YF when I was a delegate brought together the few sporadic young teenagers from across Dunfermline, the villages and even as far north as Kinross into one group. The most common feeling amongst young Christians (or teenagers who are simply considering faith) is one of feeling alone, isolated and rare in an ever increasing secular society. Bringing together one teenager from each church created a group that could lean on or support each other through the journey into faith and adulthood, a community still in touch that now stretches across the globe to Australia, Dubai, Edinburgh and London, to name just a few. These same ingredients are the ones we have used to continue YF today. We still meet on a Sunday night just after six, we still go on random adventures across Fife and we still eat copious amounts of food (mainly chips). 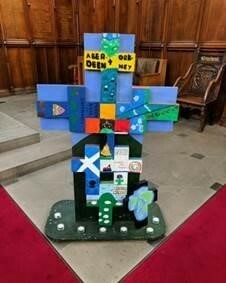 What we have done however is join up with our neighbours in Kirkcaldy. 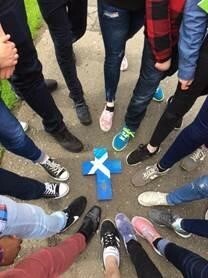 At the Provincial Youth Committees (PYC) youth week held at Glenalmond a couple years ago we met and invited a delegate from Kirkcaldy to join the YF in Dunfermline so they didn’t feel like the only teenager. We then spoke with the Revd. Christine Fraser and created what we now more aptly call the Fife Cluster YF, where we take it in turns to travel to each church or many of Fife’s tourist spots in between. The PYC youth week symbolically brings together the crosses of the 7 Dioceses (plus one representing our international delegates) of our province; they come and fit together and bring our youth together as one larger family. We have ourselves gone from having a YF made of three families and mainly siblings to one of many families, more than 12 who turn up regularly and with a real energy and passion for their individual journeys through faith. Since then not only has the group come together but they have achieved so much. 14 of the 15 people in the photo below from across our whole Diocese who went to Glenalmond came from the Fife Custer YF. Many now stand on church committees and groups, some stand on Vestry, one is even on the nominating committee for our new Bishop. Three of our youth leaders attend Glenalmond but also the many youth events throughout the year across Scotland. Our YF has spoken at Synod passionately about their faith and wanting to be involved at every level; they have attended events with other denominations and represented our whole Pisky church across the globe. We even a have a member who is now the chair of the PYC. These young adults have a deep faith, personal to them but glowing to see. They are articulate, connected, talented and passionate whilst also having a huge amount of energy and creativity to enable our churches to grow. The YF doesn’t belong to one church, to a set of leaders or even our YF rector Christine, it belongs to all of the congregations across our Diocese. It belongs to all of us because it is part of all of us. 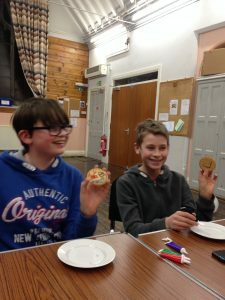 Many rectors tell me they can’t have a YF, they can’t do youth work because there are no teenagers or just one or two – but simply taking the one or two out for a coffee or some food (free food always got me interested) once a month is a youth group. We are in a very fortunate position that we have a group that is growing and set to grow even more (due to members of our young churches growing up). I ask you to feel proud and take ownership of these young adults who are from our local area, engage with them, support them and know simply talking to them or turning up to the events they run, like some of you did for the Area Council service that they hosted in Kirkcaldy last month, is all you need to do to fire and enable their faith. Sermon by our Rector, the Revd Alison Cozens Sunday 8th October 2017. A few weeks ago both at the Area Council service in Kirkcaldy and at the service here on Sunday 20th August, our young people invited us to think about something amazing God has done or shown to us in our lives recently. So I wonder if you can think for a moment of something amazing or wonderful that God has revealed to you, some inspiration or insight or encouragement. The chief priests and the Pharisees hearing Jesus’ parables were amazed by him and in fact they wanted to arrest him but they feared the crowds because the crowds regarded Jesus as a prophet. All major religions have at their heart ‘eat, pray, love’, but at the heart of our Christian religion we have the Ten Commandments given to Moses on the mountain top and recorded in the book of Exodus which we heard read today. We become like the chief priests and the Pharisees if we believe that by keeping all the rules we shall enter the kingdom of God. The young St Paul was a rising star among the Jewish community. He was a stickler for the law but then on the Damascus road he encountered the risen Christ and his life was changed for ever! What St Paul teaches us in the letter to the Philippians which we heard read this morning is that knowing Christ is all that matters, and that following Christ, even if that means enduring suffering for his sake, is all that matters. In my experience God often comes to us when we least expect it and God often speaks to us in ways that are quite amazing. If we are listening to God and to the voice of the Holy Spirit in our hearts and souls then we will often be amazed, amazed by God’s love and care for each and every one of us in our daily lives. And in it my good friend Canon Andrew Wingate reflects upon 40 years of knowing and visiting India and the very great changes that have occurred in that country over that time. As a young man just after this first curacy Andrew went to teach in Tamil Nadu and he was exposed to the great injustice of the caste system and he has continued to fight for equality for the Dalits, the Untouchables. Often a new experience in youth, a fresh expression of community, can have profound effects on a person’s life and clearly those who go to the Glen youth camp each summer have just such an experience and returning to ordinary congregations is going to be disappointing by comparison. But then again I think a lot of ministry is about the bridging the gaps for people who experience God in different ways and people who think or believe differently from us. The first is Viceroy’s House a magnificent wide screen vista movie told with an autobiographical slant by the director about the partition of India 70 years ago. Apart from its political agenda, it tells the story of how people from different backgrounds can sometimes come together or fall apart. The second film, the Butler, also has an autobiographical slant; it tells the story of one black man’s journey from the cotton fields of the deep south of America to butler in the White House concluding with a meeting with Barack Obama. Both America and India have known racial tension and violence on a scale unfamiliar to us but there are lessons to be learned for civil society as we all seek to engage prayerfully and respectfully as people of faith with our neighbours from different cultures and backgrounds. If we have a strong and rooted faith then I believe as Christian people we can engage with integrity with those who are different from us. So I wonder what it is that God has revealed to you which you have found amazing recently? Almighty God, whose most dear Son went not up to joy but first he suffered pain, and entered not into glory before he was crucified; mercifully grant that we, walking in the way of the Cross, may find it none other than the way of life and peace; through the same Jesus Christ our Lord, who lives and reigns with you and the Holy Spirit one God now and for ever. 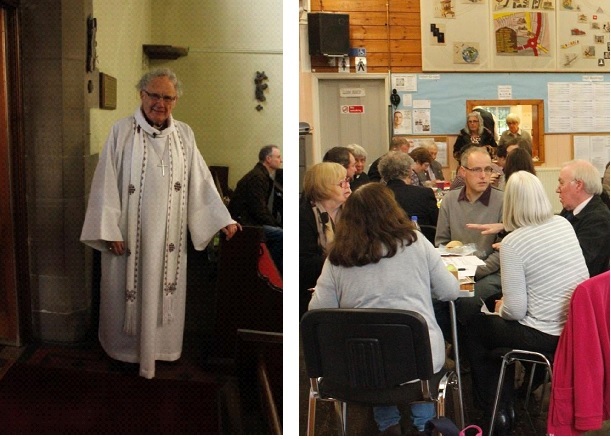 In September the congregation gathered together for a special Celebration Day and service with Bishop Bruce Cameron and our Growing Congregations team from the Diocese, the Revd. Nick Green and Morag Buxel. 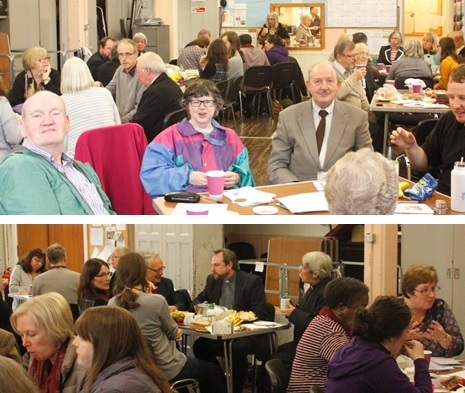 The day involved prayerful reflection on our strengths as a church, group discussions on what we could do to improve those areas we need to develop, and a time of fellowship over lunch. We ended with plenary feedback and a Eucharist service. The next stage in the process is identifying three areas of action which will help our congregation to grow in faith and numbers. Many thanks to Jack Wardell, who was on hand with a camera during the course of the day, and Andy Nicoll who recorded the event, both helped to capture us all in action!